Alexandre Dumas recognized the name of Karl Ludwig Sand, who lost his head on this date in 1820 in Mannheim, Germany, for the murder of the dramatist and humorist August von Kotzebue. 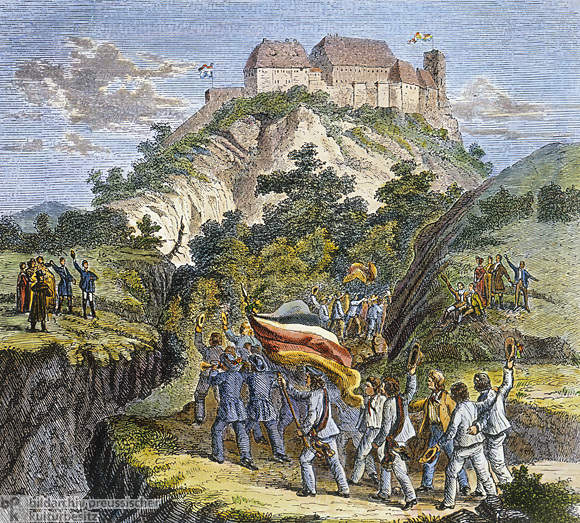 The assassination of von Kotzebue* worried the Prussian monarchy — then headed by Friederich Wilhelm III — and precipitated a series of proclamations, reforms, and internal struggles that finally led to a full-scale rebellion 30 years later. Sand was a member of a Burschenschaft,** a liberal student fraternity organization which appealed to nationalist Germans seeking a unified German nation-state, and he and others in his group regarded von Kotzebue as a plague on their cause. Von Kotzebue was then Councillor of the Russian Legation, the culmination of over a decade in the Russian civil service, and a spinmeister for the Russian regime. In 1816, while Sand was in college, von Kotzebue was tasked with managing the flow of information into the Prussian state in an effort to increase the monarch’s popularity in Germany. Longing and love in the work is described in a way which, in the judgment of the Jenaer Recensenten, resembles a light Spring rain that is at least refreshing. That is more than one can say of the Jenaer Literature-Zeitung, which roughly resembles an autumnal rain that simply makes one wet without refreshing at all. 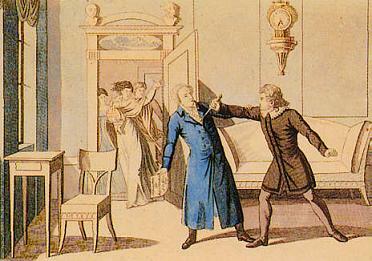 As a result of von Kotzebue’s murder, Prince Klemens Wenzel von Metternich set down a series of decrees, known as the Karlsbad Decrees, which sought to quell any thoughts of rebellion before they could fully ferment. The decrees limited both university activity and press activity, constraining the actions of university employees and setting down harsh restrictions on anyone who might dare question the monarch’s authority. Sand’s contemporaries outside of Germany were hardly pleased with the death of von Kotzebue, which they saw as the precursor to a greater turmoil, and two decades of removal from the event proved a powerful force. By the time Dumas visited the site of Sand’s beheading and penned his own biography of the man, a thorough rendering of Sand’s brief life — much of it reconstructed from Sand’s writings and the memories of those who knew him — the rebellion of the Burschenschaften was once again afoot, this time with permanent consequences for the German people. In the end, nationalism and constitutionalism were not the panaceas Sand and other Burschenschaefter may have liked. While Sand would hardly have counted as a Nazi (his Puritanical theology would have fallen on deaf ears in that regime), he would have recognized that group’s near-religious fervor of the public book burnings anti pro-German sentiments as a distant echo of the Burschenschaft’s Wartburg Festival.†† Indeed, the so-called Third Reich could never have existed without the Second Reich, whose seeds Sand and his fellow nationalists were sowing a half century early when his fateful date with the axe arrived. * The name is also spelled “Kozebue” by some sources. ** The Burschenschaften were roughly based on the Lützow Free Corps, an academic paramilitary group which fought during the Napoleonic Wars. During their height of popularity, the Burschenschaften adopted the black-red-gold flag that was reclaimed by the Frankfurt Parliament in 1949 to be the official German flag. † In the end, Sand and von Kotzebue were buried at the same cemetery. †† The Wartburg Festival, held in 1817, was a celebration of Martin Luther’s proclamation against the church. An interesting discussion of the appeal of such festivals to the students of the day is given in The Course of German Nationalism: From Frederick the Great to Bismarck.